Garnett Silk (born Garnet Damion Smith), was a Jamaican reggae musician and Rastafarian, known for his emotive, powerful and smooth voice. During the early 1990s he was hailed as a rising talent, but his career was ended by his early death in 1994, while attempting to save his mother while his house was on fire. Garnett Silk was a pivotal figure in reggae music's trend away from the dancehall music of the 1980s toward more culturally oriented reggae music in the 1990s. First making a name for himself as a teenage deejay and "toaster" in clubs around Jamaica, Silk recorded his first singles in the mid-1980s under the name Little Bimbo. By the end of the decade, he had become Garnett Silk and adopted a new style that focused on his tenor vocals and consciousness-raising lyrics. His first album, It's Growing, became the best-selling title in Jamaica upon its release in 1992. A series of concerts and compilation albums helped Silk gain an international record distribution deal with Atlantic Records in 1994. Hailed as a successor to reggae giant Bob Marley, expectations ran high for Silk's next project. While recording tracks for a new album late in 1994, however, a freak accident ended the his life when he tried to rescue his mother from a house fire. Both Silk and his mother died, and it was several years before Silk's final recording sessions were released as The Definitive Collection in 2000. Garnett Daymon Smith was born on April 2, 1966, in Manchester, Jamaica. He showed an early interest in music and before he reached his teens had made his debut as a "toaster," or deejay who accompanied prerecorded tracks in dancehalls and nightclubs. Unlike many toasters, who specialized in boastful raps or challenges to other performers, Smith--who took the name Little Bimbo--often incorporated spiritual and social themes in his lyrics. The teenager appeared with a number of notable sound system crews during the 1980s, including Soul Remembrance, Stereophonic, Pepper's Disco, and Destiny Outernational. As Little Bimbo, Smith recorded several singles in the mid-1980s, although most of them were not immediately released. His first recorded track was 1985's "Ram Dance Master," although it was "Problems Everywhere," made with producer Delroy Collins, that was his first single release in 1987. Among the numerous other recordings Smith made in the late 1980s was "No Disrespect," a single made with Sugar Minott. By this time he had started to develop his talents as a singer. A live album he made with Tony Rebel in 1989 (but not released until 1994 under his later stage name, Garnett Silk), Tony Rebel Meets Garnett Silk in a Dancehall Conference, had Smith both toasting and singing on various tracks. The late 1980s also witnessed a change in Smith's spiritual identity. Encouraged by his friend Tony Rebel, Smith began to study Rastafari, a religion practiced by 10 to 15 percent of Jamaica's population that encourages personal visions of salvation and perseverance against oppression; adherents sometimes use marijuana to help them invoke the Spirit of Jah (God). Collective Rastafari events, called grounations, also use music and drumming in ceremonial fashion. Perhaps the most famous Rastafarian was reggae legend Bob Marley, who often referred to the religion's message of salvation in his music. 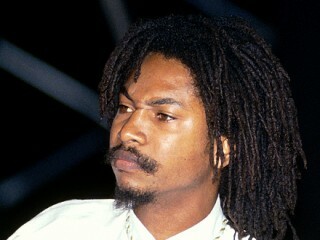 After converting to Rastafari and starting to perform as a singer instead of a toaster, Smith started to earn comparisons to Marley, in part because of the cultural and spiritual message in his lyrics. Smith also changed his stage name around 1990 to Garnett Silk, the new surname in reference to his smooth, tenor vocals. Silk had a two-year recording contract with Jamaican producers Steely and Clevie from 1990-92, but the deal spawned only one single, "We Can Be Together," a duet with singer Chevelle Franklin. Silk then recorded several singles with producer Courtney Cole, who owned the Roof International label. A cover version of Johnny Nash's 1970s "I Can See Clearly Now" became Silk's breakthrough success on the Jamaican charts, and two other singles, "Mama" and "Seven Spanish Angels," also did well on the local charts. After the singer's death, the three singles and other material were released on the Roof International album, Nothing Can Divide Us. Now an up-and-coming reggae star, Silk went into the studio with producer Bobby Digital to record his first album, It's Growing, released late in 1992. According to Steve Barrow and Peter Dalton in their 1997 book Reggae: The Rough Guide, "The release of this set, together with a swing back to cultural lyrics by deejays like Buju [Banton] and Capleton, marked a turning point in dancehall: he sang of both 'culture' and romance in a smooth tone that befitted his name change, but in a style that bore the mark of the previous ten years of Jamaican music." Indeed, It's Growing confirmed the promise of Silk's previous singles and became the best-selling album in Jamaica in the year after its release. In 1993 Silk was a constant presence on the international reggae charts, scoring American and British hits with the tracks "Fill Us Up with Your Mercy," "Oh Me Oh My," "Mama Africa," "Zion in a Vision," and "Splashing Dancing." During a concert at New York City's Ritz concert hall in 1993 Silk suffered a collapse and took six months off to recover in Jamaica. During this time a collection of his tracks was released in Britain on the Charm label under the title Gold. Silk also signed an international distribution deal with United States-based Atlantic Records that promised to bring his music to more fans in North America and around the world. Silk made a triumphant return to the concert stage at the Reggae Sunsplash event in 1994, an appearance that was released as a live album on Tabou Records in 1999. Silk began laying down tracks for his second full-length album in late 1994 with producer Errol Brown in Jamaica. By early December he had completed ten songs for the album and took a break to visit his mother and family in Mandeville, Jamaica. Silk was building a home for his family there and was disturbed that some of the building materials from the site had been stolen over the previous weeks. Borrowing two guns from his lawyer for protection, Silk was at home on December 9, 1994, with some of his friends and two of his brothers when he brought the guns out. Confessing that he did not know how to use them, one of his friends offered to show Silk how to fire them. At some point, one of the guns accidentally fired into a propane gas tank and ignited a massive fire. At first everyone in the group got out of the house, but when Silk realized that his mother was asleep in her bedroom, he returned to rescue her. Silk and his mother were subsequently trapped in the fire and died before they could be rescued. His two brothers survived the catastrophe; the 28-year-old Silk was survived by a wife and three children. At the time of his death, Silk had the number-one single in Jamaica with his duet with Richie Stephens, "Fight Back." Several singles were released after his death, including "Watch Over Our Shoulders," "Just a Man," and "Cry of My People," but it wasn't until 2000 that Atlantic Records released his last sessions as part of a two-volume set, The Definitive Garnett Silk. Numerous other compilation albums have since appeared, including Nothing Can Divide Us (1995), Silky Mood (1995), Journey (1998), and Garnett Silk: Collectors Series (1999). Silk's music has been kept alive by several tributes, including Macka B's "Tribute to Garnett Silk" and the Earth Day concert, and numerous compilation albums, including two collections of his dubplates, Kilamanjaro Remembers Garnett Silk (Jam Down, 1999) and Rule Dem (Trojan/Sanctuary 2006). In 2000, Atlantic finally released The Definitive Collection, a two-CD set showcasing the ten tracks the singer had recorded during sessions for his unfinished second album. View the full website biography of Garnett Silk.